Successfully Added Biometric Fingerprint Door Lock - Left Handed Installation, 100 Fingerprint Capacity, Key Back-Up, LED Power Indicator to your Shopping Cart. 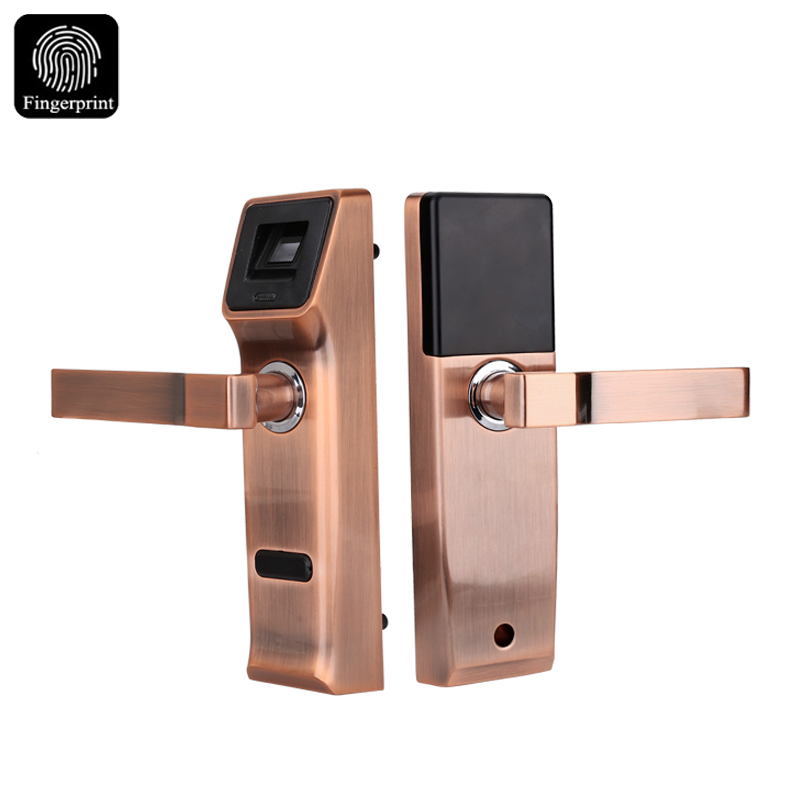 Upgrade your property and significantly increase your security with this magnificent fingerprint door lock. Suitable for left-hand opening doors where the hinge is located at the left when viewed from the outside, this electronic door lock allows you to enter your property at any time without the need of a key. From now on you no longer have to worry about bringing along your key while heading out as, with this fingerprint security door lock, you’ll always be able to open your door with the touch of a finger. This Biometric fingerprint door lock works on four AA batteries, making it easy to install as no external wiring is required. By fitting most cylindrical locksets, this Biometric door lock is a true asset that increases the security of any household and office out there. Being capable of storing up to 100 fingerprints, this security door lock allows you to simply provide access to your house or office space to all your friends, colleagues, and loved ones. No longer will there be the need to print an abundance of keys as, with this fingerprint door lock in place, you and all others will be able to enter the building by a simple touch of this state of the art fingerprint door lock. Thanks to its easy to operate design, this electronic door lock allows you to simply insert and delete fingerprints in a split second – ensuring that at any given moment the right people have access to your property. Besides its fingerprint feature, this security door lock can also be manually unlocked the old school way by using a key, ensuring that you’ll never be locked outside when returning home from a long holiday during which your electronic door lock potentially has ran out of battery. Additionally, this fingerprint lock also features a low voltage warning system that informs you when your lock is running low on power. In case your batteries do run out of juice some day there is no need to fear about losing the stored fingerprint data as this Biometric lock stores all data within, ensuring that it will always stay available even when the lock has not been used and without power for several months in a row. With less than 1:100,000 false accept rates, this fingerprint security lock is highly accurate and significantly increases the security status of any property out there. Being capable of reading fingerprints in every angle, you can be assured that your fingerprints will always be read properly and you’ll never be locked outside again. Reading your fingerprint in less than a second and unlocking your door instantly, this Biometric security door lock is guaranteed to provide a smooth experience that saves you time while, simultaneously, increasing your property’s security level. This Biometric Fingerprint Door Lock comes with a 12 months warranty, brought to you by the leader in electronic devices as well as wholesale electronic gadgets..
Arabic: - باب الأمان فينتيربرينت - Chinese Simplified: - Finterprint 安检门 - Czech: - Finterprint bezpečnostní dveře - Dutch: - Finterprint beveiliging deur - French: - Porte de sécurité Finterprint - German: - Finterprint Sicherheits-Tür - Hebrew: - דלת בטחון Finterprint - Hindi: - Finterprint सुरक्षा द्वार - Hungarian: - Finterprint biztonsági ajtó - Italian: - Porta di sicurezza Finterprint - Japanese: - Finterprint セキュリティのドア - Korean: - Finterprint 보안 문 - Malay: - Pintu Keselamatan Finterprint - Norwegian Bokmål: - Finterprint sikkerhetsdør - Romanian: - Usi de securitate Finterprint - Russian: - Finterprint дверь - Spanish: - Puerta de seguridad Finterprint - Thai: - Finterprint ประตู - Turkish: - Finterprint güvenlik kapısı - Vietnamese: - Finterprint Security Door.